Have you run out of flowery words to say “I love you,” “Happy Birthday” or “I’m sorry”? Or maybe you need an extra special gift for your anniversary, Valentine’s Day or for your mom on Mother’s Day? Then, a beautiful bouquet of flowers in Singapore should help! A quick Google search might return thousands of results for “flower delivery in Singapore.” Luckily, we’re here to speed up your search for the best Singapore flower delivery services with a list of Singapore’s best online florists. Order professionally arranged flowers in Singapore with just a few touches on your smartphone. 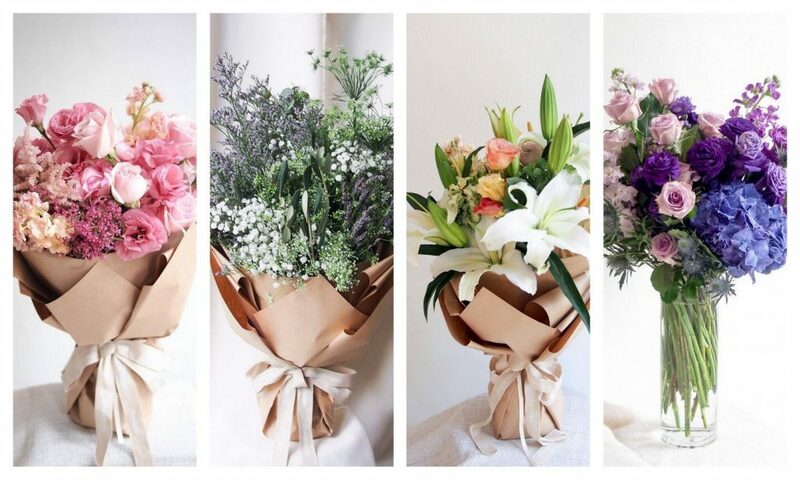 So if you want to have a hassle-free experience in buying bouquets, check out the following 12 highly recommended flower delivery in Singapore. Happy Flowers serves as an ambassador of happiness in Singapore through their beautifully crafted and affordable blooms. To make sure they put a smile on their customer’s face, quality and speed go hand-in-hand. 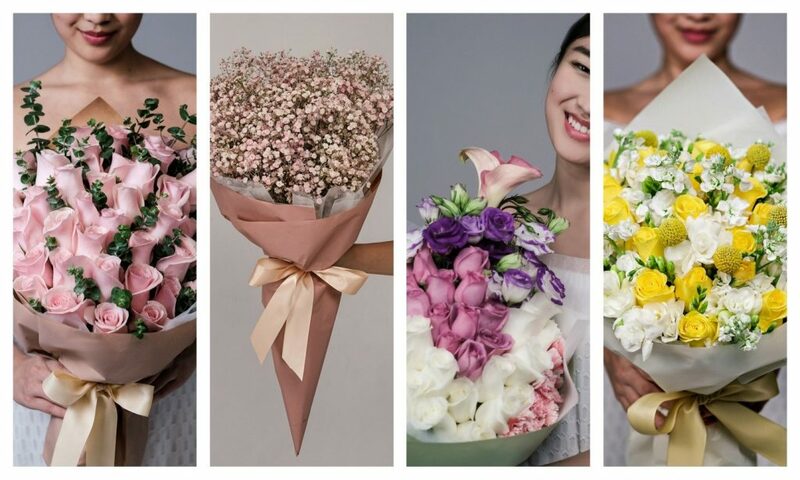 That’s why their slogan is “Happiness delivered wherever in 90 minutes!” Their professional florist handcrafts each order using the freshest blooms sourced from flower farms in Cameron Highlands for long-lasting floral designs. From modern hand bouquets, gorgeous grand opening stands and comforting funeral wreaths, Happy Flowers pays special attention to details to convey the appropriate story and emotion. Then, their impressively fast flower delivery in Singapore ships the order from the shop to the recipient’s doorstep in less than 2 hours. So, make someone happy today with Happy Flowers! 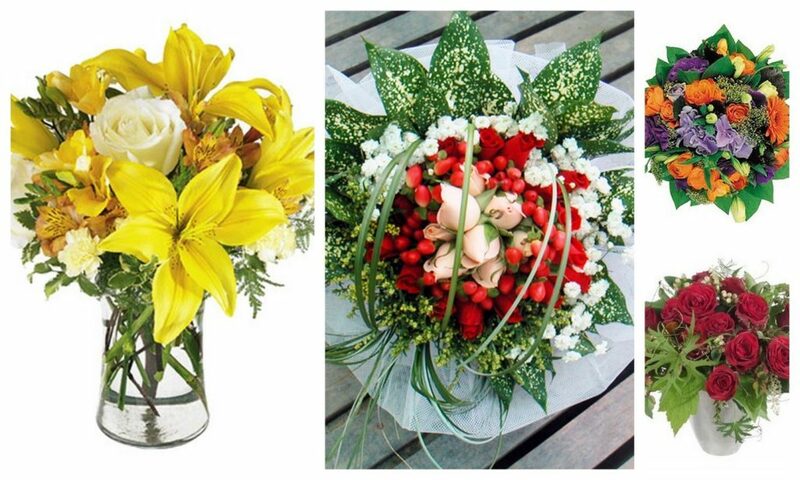 A Better Florist’s signature service is their lightning fast flower delivery in Singapore. With their express flowers service, they guarantee the delivery of your fresh flowers from their shop to your loved one within 90 minutes! This is very impressive and quite convenient especially if you have inadvertently forgotten an anniversary, a birthday or you need the flowers urgently to make amends. Fortunately, they also have a range of beautifully arranged hand bouquets and modern vase arrangements suitable for all occasions. You get both quality and speed from this top-notch Singapore online florist. The large, feminine hand bouquets from Her Flowers include a generous amount of focal blooms yet their luxurious flower arrangements remain affordable. This flower delivery in Singapore touts self-care as the philosophy behind their gorgeous floral collection. Bouquets are inspired by women who deserve to treat themselves to wonderful arrangements of fresh flowers. They also offer free Singapore flower delivery island-wide which is a big plus! So if you want to send a bouquet to cheer up a loved one or empower your female friends, go check out Her Flowers. 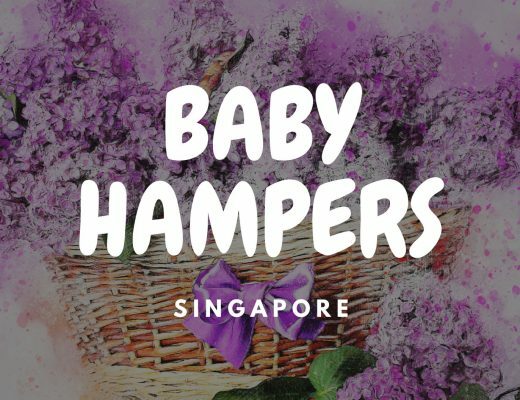 With Flowers & CO Singapore, you don’t have to suffer through last-minute supermarket dashes and disappointing deliveries. You can conveniently buy their beautiful bouquets for all occasions online, at your own time and comfort, and simply wait for the flowers to be delivered in no time with their 90-minute guaranteed express delivery islandwide! They have developed their bespoke presentation boxes that not only highlight the beauty of the flowers inside, they also serve to preserve and protect every petal. Lastly, you won’t have to blow your budget with their budget-friendly options that are equally stunning. Flower Addict handcrafts creative, contemporary designs with flexible delivery options for their customers. 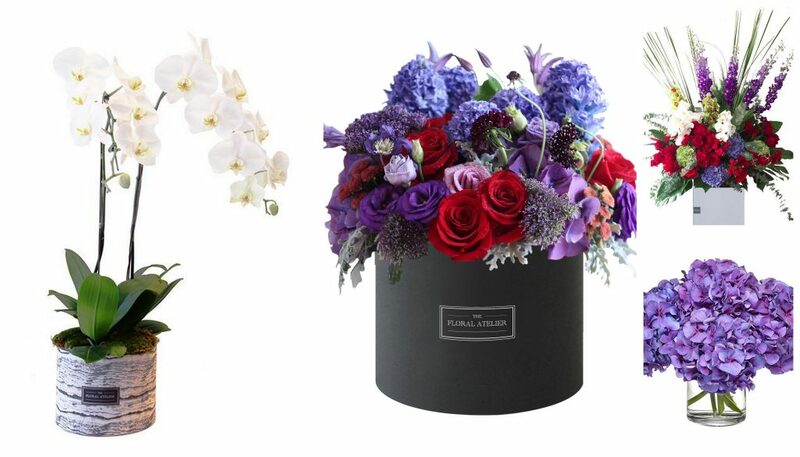 They use premium blooms with an emphasis on unique packaging in bespoke boxes all at reasonable prices. For every design, customers get the chance to arrange the blooms yourself or choose to have it delivered professionally arranged as a hand-tied bouquet. If you select the “Style Yourself” option, you will receive loose flowers, carefully conditioned and beautifully presented in a bespoke box. Crafty and creative customers can style and arrange the cut flowers as they please. Floratorie provides all sorts of flower-related services, including flower delivery, floral workshops, wedding floral and event styling. Their floral designs are clean and polished with lots of dainty and feminine touches. Their floral creations can blend seamlessly with any interiors, especially those with a minimalist aesthetic. Send Floratorie flowers to friends and loved ones or as a gift to yourself. Their Instagram-worthy fresh flower arrangements can serve as great accents to your home. HQ Flowers provide simple yet meticulously arranged bouquets and arrangements in various designs depending on the occasion. Their bestselling pastel-perfect rainbow Baby’s Breath bouquet is perfect for baby showers, birthdays, graduations or to cheer up a friend on a regular day. For special and romantic events like Valentine’s Day, you can choose from a selection of large and luxurious bouquets guaranteed to make the moment extra memorable. If that’s not enough for you, their LED bouquets will provide the extra shine and sparkle. For the budget conscious, they have pretty mini bouquets. They post monthly promotion codes on their social media, so follow them to get discounts on your next purchase. Petite Fleur handcrafts bouquets for every occasion using only premium blooms. This makes their creations made with high-quality blooms last longer than the average bouquet. With a keen eye for detail, founder Patricia makes sure each arrangement evokes a vibrant expression of art and beauty. Their petite floral boxes are pastel perfection ideal for bright and happy occasions. For a showstopping surprise, their floral basket brimming with gorgeous blooms and foliage should do the trick. You can also check out preserved roses in chic, acrylic boxes as a stylish keepsake for romantic moments. One Olive handcrafts bouquets and arrangements that are anything but ordinary. Their selection includes a dramatic bouquet of Phalaenopsis orchids and Hydrangeas, flawless yet naturalistic arrangement of Tulips with seasonal pairings of exotic flowers, imported preserved Roses and Magnolias that are specially composed in elegant boxettes, and Bloom Box brimming with pretty pastel flowers styled with an elegant composition. What stands out most amongst other florists, is their specialty in the aesthetics of Floral Styling. One Olive gives it another wowing factor and dimension in their floral works. This artisanal floral boutique helps you send flowers that truly stand out. For wedding and event styling, you can consult with their team of floral artisans to help you bring your vision to life. Fleur de Style uses the finest flowers and high-quality materials for their sophisticated floral designs which are sold at reasonable prices. For fresh floral designs, they have a wide selection of hand bouquets, wedding flowers, grand opening stands, condolence stands and table arrangements. You’ll also find hampers and gift bundles to help you make someone smile. They offer free delivery from time to time, so make sure you follow their social media for announcements, so you can save money on your next floral purchase. 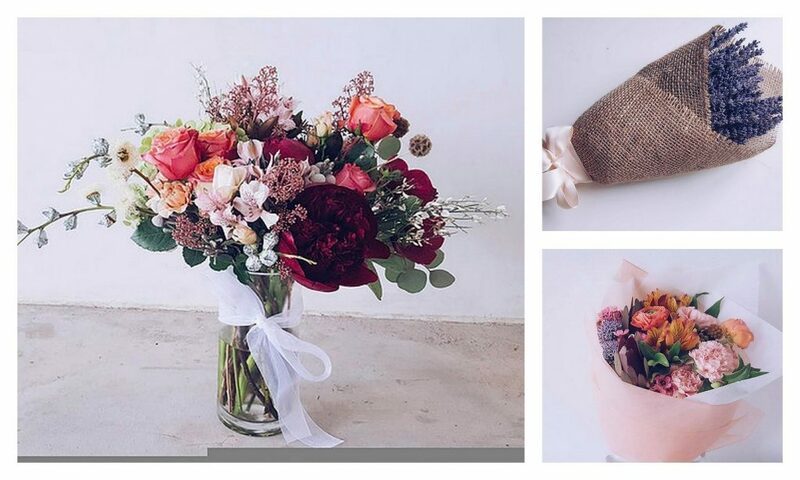 The Bloom Inc delivers beautiful wrapped bouquets, dried flower bouquets, Valentine’s Day Special Letter Bloomboxes, dried flowers, glasshouse flowers, preserved flowers and cupcakes in Singapore. They also provide floral arrangements for weddings and events, including bridal bouquet, wedding decorations, bridal car decoration, party/events styling, among others. For fresh flowers, they need a lead time of 1-2 days. At Happy Bunch, you can order fresh flowers online in 5 easy steps. First, pick a delivery date from Monday to Saturday. 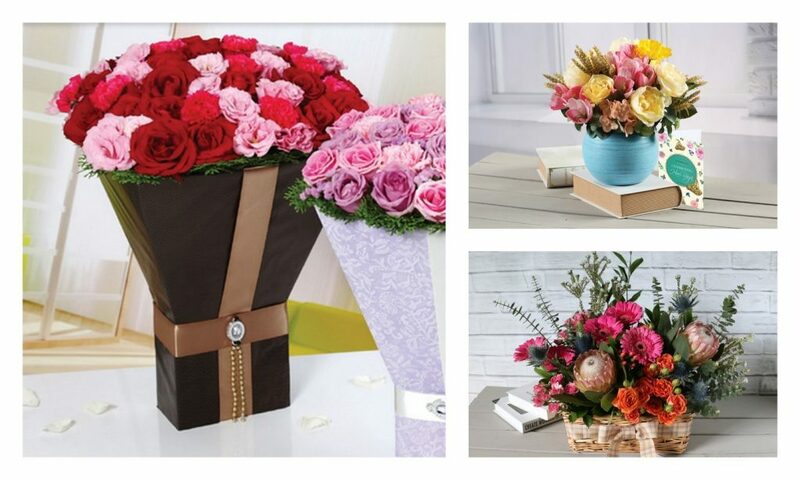 Second, choose your preferred bunch design from their range of simple and affordable bouquets. Third, select a size from double, triple, quadruple or quintuple depending on the impression you want to make. Fourth, indicate whether the flowers are for delivery or pick-up. Finally, sit back and relax as they deliver the flowers to bring a smile on someone’s face. 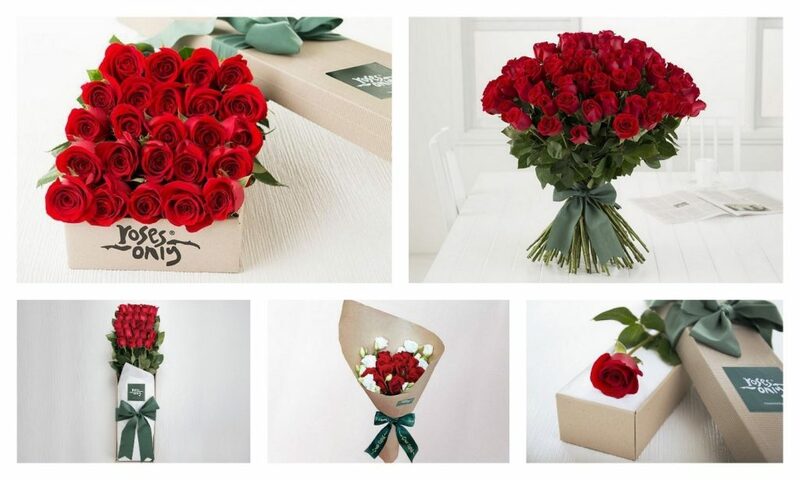 Order by 12:30pm for same day flower delivery in Singapore. The Green Room is an online flower shop in Singapore taking inspiration from the graceful beauty of nature to create beautiful, garden-style floral designs for all occasions. They keep their packaging pretty yet practical, always aiming to enhance the beauty of the blooms and foliage instead of overpowering them. Buy their flowers quickly and conveniently online or get in touch for floral consultations for weddings, events or bespoke requests. Petalfoo was originally spelled as “Petalful” as in “full of petals.” Founder Kelly Chua eventually decided to name her business after her late father, Chua Yat Foo. Hence, Petalfoo. Petalfoo excels at unconventional bouquets and flower arrangements, whether it’s incorporating fairy lights, using confetti tubes, or crafting edible bouquets from various tasty treats. Soap n Petals create stunning yet affordable bouquets to make more Singaporeans appreciate the beauty of flowers. They deliver fresh flowers free, anywhere in Singapore. They do hold frequent promotional campaigns, so you can get great deals and discounts for your orders. As indicated in their name, they also sell soaps. Their all natural cold process soaps are infused with essential oils and decorated with colourful swirls. Grab the ultimate care package of fresh florals and soaps for your friends and family from Soap n Petals. The Florté uses flowers individually handpicked from trusted gardens and nurseries to ensure that customers get the freshest and top-notch quality. Their floral designs include elegant bloom boxes, lush bouquets, customised arrangements, table top blooms, everlasting flowers, congratulatory stands and condolences stand. Each product are meticulously arranged for a polished and professional final product. Sign up to their newsletter for a discount. Floral Connoisseur caters to floral enthusiasts with a discerning eye for style. Their European-inspired arrangements of fresh flowers in hatboxes and transparent acrylic containers shows off the premium blooms to maximum effect. They also accommodate customised orders of their bestselling floral designs. Just let them know your budget, preferred flowers and colour theme. Enchanted Fiore is Singapore’s premier preserved rose specialist, but they also provide fresh bloom boxes available for flower delivery in Singapore. Fresh or preserved, their flowers are flawlessly arranged in various stylish containers, including hat boxes, acrylic boxes, gift boxes, glass domes, rustic wooden boxes, among others. Unlike the usual cut flowers, their preserved roses can last for a year! Enchanted Fiore crafts each piece to order, and caters to custom designs and preferences. Tropifame Flora By Karen branched out from her parent company Tropifame Floral Design School Pte Ltd in 2017 to focus on creating unique designs with everyday materials. They specialise in life-size bouquets and custom flower arrangements. Their online shop showcases a wide range of floral products, gift products and other flower-related services thoughtfully curated and tailored for each occasion. Craftway Floral opened shop in the 1990s. They professionally crafted floral arrangements for any occasion or sentiment you wish to express. The provide delivery of indvidual floral bouquets, flowers for weddings, corporate corsages, congratulatory flowers, condolence flowers, garlands, artificial flowers, artificial plants and table arrangements to all areas in Singapore. You can browse through their online catalogue for the perfect bouquet or arrangement. If you don’t find anything suitable, feel free to reach out to them so their skilled floral designer can customise a floral arrangement just for you. Fleur D’sign is a bridal studio in Singapore which will help make your special day perfect. Let them work their magic on your wedding gown, hair and makeup, photography and videography, and of course decor and styling– all within your budget. You can also buy individual daily blooms and flower arrangements for delivery in Singapore. DELIVERY FEE Standard delivery: $5.90. Flowers and Kisses started in 2017 borne out of the owner’s aim of selling “quality and stylish floral bouquets at an affordable price.” Damien’s floral fascination was sparked during his childhood by watching his mother lovingly tending her garden. From a flower enthusiast and hobbyist, he eventually became a professional florist sharing his expertise and delivering handcrafted creations to his customers. 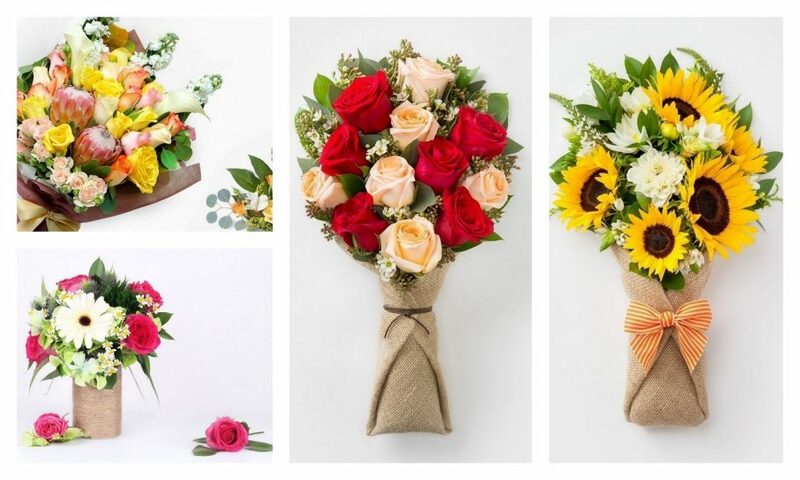 Popular floral products at Flowers and Kisses are fun, vibrant bouquets of sunflowers, baby’s breath and daisies perfect for cheering up loved ones on regular days or as graduation bouquets. Established in 2015, First Sight Singapore is an online floral boutique offering cute and charming fresh bouquets and preserved flowers. Their founder has made numerous trips to South Korea not only to perfect her floristry skills, but also to acquire impeccable materials to incorporate in every bouquet. As a result, customers can enjoy scrolling through their curated selection of vibrant floral designs. Lush and love showcases a small yet varied and versatile floral designs suitable for any special occasion or feelings you may want to convey through flowers. They have garden-style, rustic arrangements in wooden boxes; pretty, petite posies in “ice cream” cones; romantic, wrapped hand bouquets; whimsical arrangements; and polished, elegant bloom boxes. 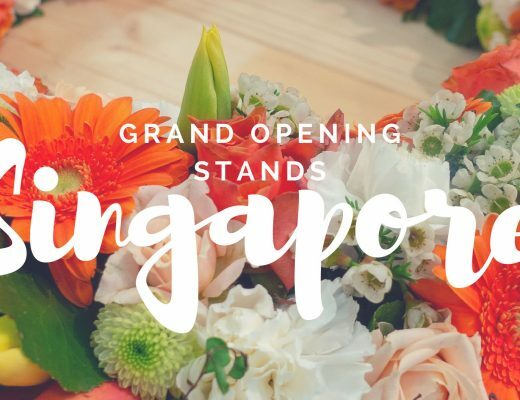 Their floral creations are all reasonably priced to bring professionally handcrafted bouquets and arrangements more accessible to Singaporeans. Floral Passion started in Valentine’s Day 2017 fueled by a passion to share joy through the beauty of flowers. The result of this desire to spread happiness is a thoughtful collection of floral products in a variety of designs to suit different tastes and customer preferences. From a single sunflower stalk to an elegant bloom box of gold preserved roses and premium hydrangeas brimming out of a stylish hat box, you can find the perfect style and price point for you. 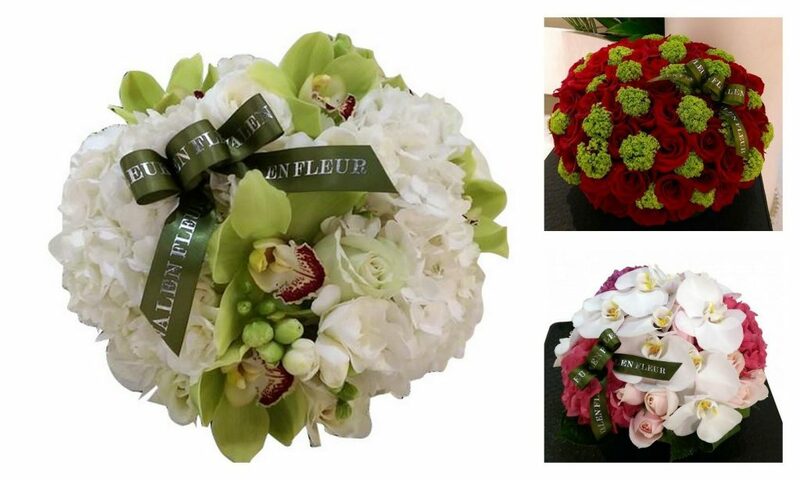 Fleuri Garden is an online flower and gift shop providing fresh, affordable and customisable floral designs. You’ll find various floral styling to suit different needs. Choose from unique designs, modern, classic, stylish, exotic and elegant arrangements. If you want something dramatic and showstopping, then head over to their Signature Designs featuring black marbled packaging as a chic finishing touch. Fern Studio75 specialises in wedding and event styling, but they do provide daily bouquets based on customer budget. So, instead of having a selection or online catalogue to choose from, just provide your budget, your preferred flower choices and let them do their magic. Floral designers at Fern Studio75 will make sure the floral arrangement will complement the character and personality of your intended recipient. The Floral Experiment specialises in bespoke bouquets and arrangements. If you want a unique floral gift to give to your special someone or add personal touches, then The Floral Experiment can help you create a one-of-a-kind arrangement to make flower delivery extra memorable for you and your recipient. Check out their website and social media for samples of their designs. Bucket of Blooms provides floral styling for weddings, special occasions and events. They also offer one-off individual bouquets for weddings and other special events. Instead of choosing from a selection of floral designs, Bucket of Blooms will tailor a bouquet or arrangement according to your preferences or your recipient’s personality. This makes buying fresh flowers online a more interactive and personal experience. They currently offer free delivery, so make sure you stay updated with their promotions. TOKI means “Time of Opportunity.” This term exemplifies their belief that every day is an opportunity to celebrate and show appreciation to loved ones. TOKI is owned by a couple, Kim and Wyner, who share a passion for flowers and floristry. While they make excellent floral creations for all occasions, their romantic bouquets for proposals, anniversaries or Valentine’s Day stand out. To hone their skills and keep refreshing their floral selection, they make it a point to learn from international florists (Korea, Japan, Hong Kong and US) and infusing their own personalities and creativity into their craft. Place your order via Whatsapp: Pay via Cash / iBanking / PayLah / PayNow. If longevity is your main quibble about fresh flower arrangements, then The Enchanted Rose is your friend. The founder, Jean, adores receiving floral bouquets from her husband yet she couldn’t bear to see the fresh flower bouquets wilt and wither after just a couple of days. Hence, the idea for the brand was born. The Enchanted Rose offers real preserved Ecuadorian Roses of the highest quality presented in luxurious Glass domes. These elegant keepsakes can last up to 5 years with minimal care (no watering or sunlight required) while maintaining the real shape, touch and beauty of a rose. Bloomwerkz is an online floral & design studio in Singapore offering flowers, styling and hands-on services. Their online catalogue showcases uniquely designed flowers fit for every occasion. Their team can handcraft arrangements be it weddings, birthday parties and any event. Floraascent is a bespoke floral studio in Singapore showcasing a carefully curated selection of floral designs. They’re happy to collaborate with customers to ensure each and every arrangement is tailored to their tastes, preferences and floral needs. You can choose to buy flowers in jars, as wrapped bouquets or opt for everlasting flowers as keepsakes that can last for years! Fleuriste is a boutique and online florist in Singapore founded by professional florists Joan Chua and Sarah Ching in 2015. They specialise in bespoke rustic everyday bouquets, bridal bouquets, and wedding and event styling. Customers can also purchase their flowers online and place orders in a just a few clicks. Beato stands out from other florists and flower shops for their unwavering attention on originality and creativity. Flower lovers looking for one-of-a-kind bouquets and arrangement will enjoy Beato’s bespoke floristry. You can choose between omakase (floral designer’s choice) or ala carte where you’ll find a diverse range of styles, such as a single stem, lush mix of seasonal hand bouquets, exquisite styling in vases, their signature gift styling / hampers or flower stand arrangements suitable for any occasion or intention. The bucolic quality of Poppy’s flower arrangements stands out from the usual polished designs you often find in flower shops. Most of their arrangements use generous greenery, wildflowers and other filler foliage to achieve a freshly-picked and informal effect. Those looking for unconventional bouquets for their next flower delivery order has found the perfect partner in Poppy Floral Studio. Katong Flower Shop was established in 1948 and has steadily diversified their products over the years. With a large collection of hand bouquets, grand opening flowers and sympathy blooms, you’ll definitely find an arrangement to suit your needs. All sizable orders come with free same-day flower delivery. Hazel Florist has over a thousand options for various events and occasions. This is good if you’re very particular about design and you don’t mind browsing pages of flower arrangements. They also have a 2-hour express flower delivery service for an added cost of $20. Their standard delivery is free for most places, except deliveries to Singapore islands (e.g. Sentosa and Jurong Island) and restricted areas such as the Airport Passenger Terminals, Airport Cargo Complex, PSA ports and military camps which would incur a flower delivery surcharge of $20. Keira Floral excels in creating rustic bouquets and garden-fresh baskets courtesy of their flower-loving founder. Their curated collection are whimsical and charming evoking country living and lush landscapes. Orders need to be placed two days in advance though since their designs depend on the availability of flowers. The good news is that you get unique statement bouquets that are far from generic. Fleurapy got their name from “fleur” (flower in French) and therapy. It’s perfect because flowers definitely have a calming and soothing effect on people. They can also effortlessly cheer you up with their beauty. 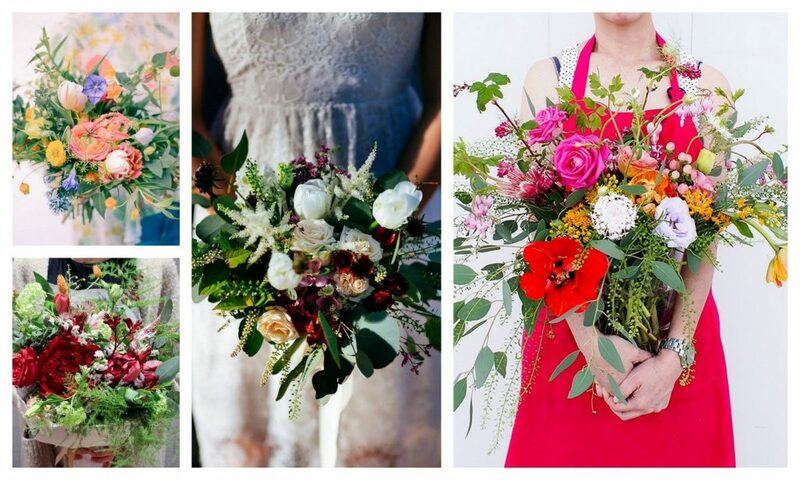 Though it’s their travel-inspired bouquets that became their core collection. With flower arrangements inspired by iconic locations such as Paris and Tokyo, feed your wanderlust or reminisce about your travels. 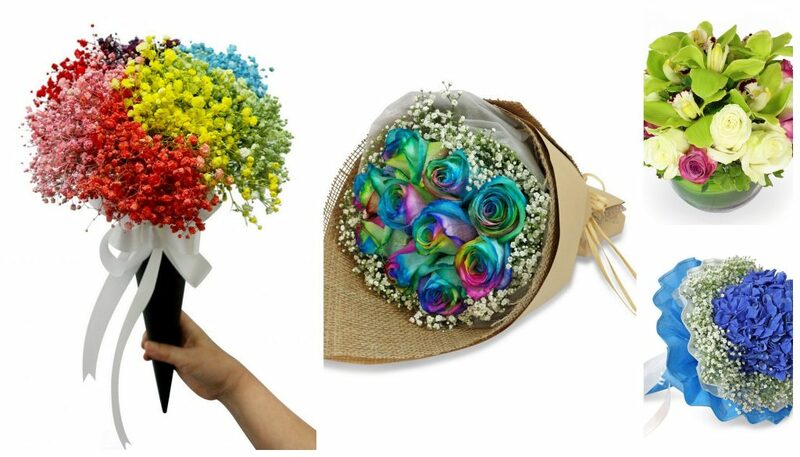 Rainbow bouquets are Flora Moments’ signature creations. Just like a rainbow, their flower arrangements are very colourful and vibrant. Their head florist has over a decade’s worth of floristry experience, so you can expect professionally arranged fresh flowers when you order from them. The best part about their online shop is the built-in customisation for your order. You can filter the occasion, the intended recipient of the flowers as well as your preferred colour for the bouquet. You can even choose the size of the arrangement and the type of card you want to accompany for your personalised message. You can’t go wrong with a bouquet of red roses. Roses Only knows this, so they’ve come up with a shop dedicated to the most romantic of blooms. You still have plenty of choices, of course, from pastel-coloured roses to white roses, the deep reds as well as other flower varieties. So woo your wife, girlfriend or a romantic prospect with roses and champagne from Roses Only flower delivery. Flower arrangements are on the pricey side at The Floral Atelier, but you’re actually paying for professional florists to craft meticulously designed creations to impress even the most discerning flower enthusiast in Singapore. After all, their florists have been professionally certified by the Flower School of New York. If you’re the type who likes to make a big impression, Valen Fleur’s large handmade bouquets would certainly do the trick. The lifestyle magazine Singapore Tatler has even named them one of the best florists in Singapore because of their luxurious arrangements, but expect the cost to be commensurate to the opulence of their creations. 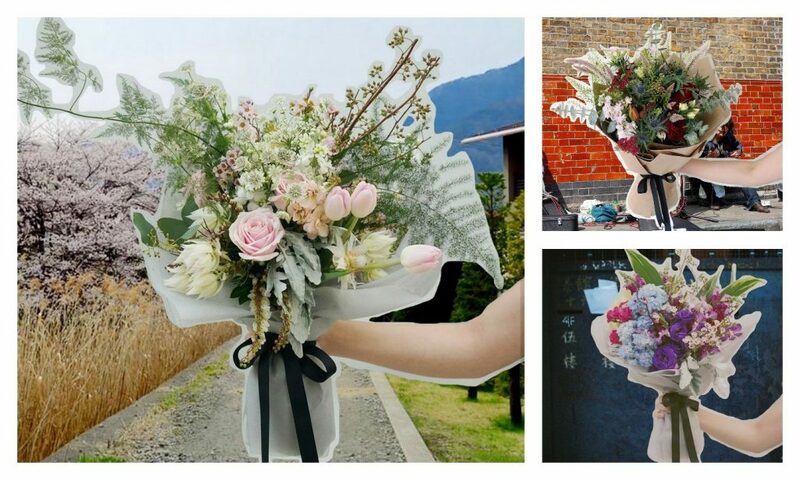 Floral Magic’s expertise lies in wedding-related flower arrangements, though they also sell retail bouquets on their online shop for flower delivery in Singapore. As such, their flower designs are fittingly romantic with soft colour palettes. Top flower choices are bridal favourites like peony and hydrangea. They do have a two-day processing for purchases, so you need to order early. You can also call +65 6337 6398 to inquire about same-day deliveries for urgent requests. Floral Singapore.com Pte Ltd is pleased to be included in a mention of the award and a link to our website. Our website is undergoing re-construction and will be ready shortly.